I have already posted one version of Pal Kozhukattai recipe here. This is another interesting and delicious version of Pal Kozhukattai. 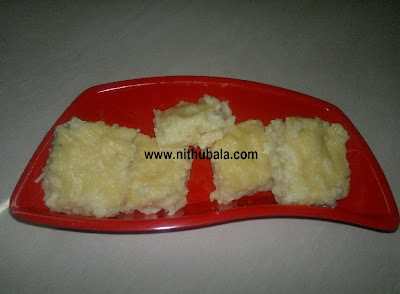 This recipe is quite different from the usual kozhukattai recipes. This needs plenty of time and patience. But I'm sure it's worth trying. My friend Nivi Karthik sent me this recipe. Thanks to her for sending me this wonderful recipe. I made few changes to her original recipe. Bring water to boil. Add oil and salt to the boiling water. Once the water is boiled well, switch off the stove. Add water a little by little to the flour.Keep mixing the flour with a wooden spatula while adding water.The resulting dough should be like chapathi dough. Bring water to boil. Put powdered jaggery.Let the contents boil till the jaggery is completely dissolved. Switch off the stove and let the contents cool. Filter and keep aside. 1. Combine milk and water in a thick bottomed deep pan. 2. 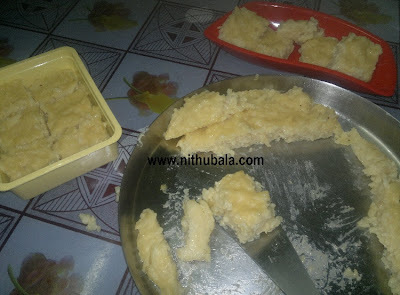 When contents starts to boil, stuff a murukku presser with dough after greasing it with a little oil. 3. Gently press on the boiling milk. When the dough is cooked, it will start to float on the top. 4. Repeat the procedure for the remaining dough. 5. Add coconut, cardamom powder, nuts and jaggery syrup to the boiling contents. 6. Keep stirring till the contents are thick and starts to leave the sides of the pan. 7. Pour a little quantity of ghee and switch off the stove. 8. Grease a plate with a little ghee. Transfer the contents to the plate. 9. Let the contents cool for atleast 1 hour. 10. Then cut in to pieces and serve. 11. Even if you refrigerate and consume after 2 days, it would taste good. 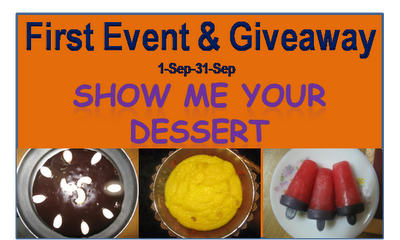 Along with this, Sweet Ammini Kozhukattai (Pallu Kozhukattai), Ellu Kozhukattai, Pal Kozhukattai (Version 1) and Sweet Kozhukattai(Modakam) make their way to Pari's First Event & Giveaway. Very different and interesting kozhukattais. very new and interesting.. From picture, it looks like burfi!!! I am bookmarking this!!! New and interesting..must try recipe..